When you’re a student in Computer Science, you never have to be alone; that is, unless you really want to, but we don’t recommend it. You will have more fun participating in one of the amazing organizations on campus or volunteering at a department or campus event. Joining a student group on campus has many benefits. Student groups help you connect with other students on campus that share similar interests. Groups organize social events, manage fundraisers, create industry partnerships, and offer services to students. It's a great way to get involved and have a positive impact on your community. The CSSS is a student run group that offers various services and events for Computer Science undergraduate students on campus. We encourage all students to purchase a membership! Yearly memberships provide access to old exam files, locker sales, and discounted events. The Computer Science Career Fair, a one-day event during the winter term where employers are invited to set up booths and give presentations to students to provide them with more information about their companies. Students are encouraged to chat with employers and hand in resumes. A range of local events, such as Unix Bootcamp, LAN Parties, video game tournaments, board game nights, weekly lounge events, and much more! Various food, snacks, and beverages for sale. You could even become a member of the executive group. These roles include: President, Vice-President, Secretary, First to Fourth Year Representatives, Athletics Director, Social Director, and Member-at-large. Voting for these positions take place during the CSSS Annual General Meetings in September and November. The collegiality of our department is reflected in the high level of graduate student involvement and influence in its operation. The Computer Science Graduate Course Council or the "CSGCC" for short, is the organization constructed and operated by our graduate students to act on their behalf. The Council acts as the Computer Science Graduate Student’s representatives to the University of Saskatchewan Graduate Student’s Association (GSA). It provides communication between the GSA and the graduate students in the department. The CSGCC also takes on the task of maintaining a certain level of communication between the Department of Computer Science and the graduate student body that resides in it. The CSGCC has non-voting representatives that attend Graduate Committee meetings and Faculty meetings. In addition, the CSGCC receives some funding from the University-wide GSA to carry out its operations. In return, the CSGCC organizes social events for the Department, such as welcoming activities for new graduate students and social gatherings throughout the year. The social events organized by the CSGCC include different sporting activities, games and outings to be enjoyed by the graduate students, faculty and staff. Finally, the Council assists and advises new students moving to the University of Saskatchewan. All graduate students within the Department of Computer Science are by default a member of the CSGCC. No membership application or fees are required. Positions on the executive include: President, Vice-President of Finance, Vice-President of Internal/Webmaster, Social Representative, MSc Representative, PhD Representative, and a Faculty and Staff Liaison. Visit the Arts and Science website for more links to useful organizations. If you're looking to get more experience in Computer Science, you have come to the right spot. This is a one stop shop where students can browse different oportunities to get invoved within the Computer Science community on campus. The list is comprised of workshops, contests, student works, entrepreneurial initiatives, and graduation celebrations. Get the full Computer Science student experience and beef up your resume at the same time. The University of Saskatchewan Programming Contest is a fun and local competition where student teams from local academic institutions and industry compete against each other in a friendly contest that is meant to test the competitor's skills in problem solving and programming. All skill levels are welcome to participate. 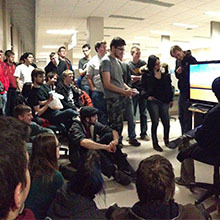 A Game Jam is an event where a diverse set of participants come together and develop a video game over the span of 48 hours. That’s right, just over a single weekend! You will be surprised at what you can do with a motivated team and a short amount of time. Participants prototype, design and create a video game in a short period of time. The condensed 48-hour time limit encourages creative thinking between participants with different backgrounds and skill sets. Game Jams result in small but innovative and experimental video games. Typically participants work in small teams, racing to produce a game with limited time and resources, but unlimited creativity. Game Jams are about discovery, innovation, and creativity. Not everyone has a finished product at the end – one of your biggest takeaways is a valuable learning experience. What does the “jam” in “Game Jam” mean? : Jam is a reference to the musical jam sessions performed by bands and artists. Not to be confused with a traffic jam or a delicious spreadable fruit jelly. The biggest reason to join a Game Jam is to have fun. Either exploring a new gaming concept or practicing your artistic skills, you will have a blast learning and making new friends – all while developing and playing video games! People with all skill levels and interests are welcome to participate in the Game Jam. During the past events, participants ranged from programmers, students, artists, game enthusiasts, and designers. The formula of gathering participants with all different backgrounds to work together will result in creating something fun and innovative. For those who are interested but might not have a lot of programming experience, we will be offering game development tutorials to get your skills up to speed. 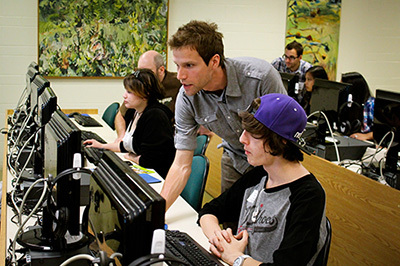 Game Jam events usually offer workshops to familiarize participants with various game development environments, such as Processing, Unity and Unreal4. Game developers from the industry are invited to speak over the weekend, giving insight into their experience and careers in game development. Game Jams are usually organized by Game With US – a group of Human-Computer Interaction students who are passionate about game development. For announcements and more information about past and upcoming events, check out the Game Jam website. Every September, to kick off a new academic year, the Computer Science Student Society(CSSS) organizes a Linux Bootcamp for students to refresh their technical skills. The day starts with a beginner Linux session, followed by an intermediate and advanced session. Students will have an opportunity to meet the new CSSS Execs, enjoy a pizza lunch, tour the Department and get their CSSS memberships. Listen to the September announcements for more information. Students can gain valuable and relevant work expereince during their studies at the University of Saskatchewan. The Department offers a range of possible employment opportunities, including Tutorial Assistant and Marker positions for classes every term, summer research opportunities, and more. Details, on how to get hired during school, are available on our recruitment page. Industry representatives are invited to meet with the students and give talks. It is a great opportunity for students to network and hand out resumes. This event is organized by the CSSS. Every Spring, The CSSS and the Department of Computer Science hold a banquet to celebrate our graduating students and all the accomplishments our faculty, staff, and students have achieved during the academic year. The evening includes a dinner, speeches, awards, entertainment, and a surprise or two. Everyone is welcome to attend the banquet, including all students, faculty, staff, researchers, family, friends, alumni, and special guests. For more information on the Computer Science Spring Banquet, listen to the announcements or contact the Computer Science main office. The i3 Idea Challenge is an annual business idea competition hosted by the Wilson Centre for Entrepreneurial Excellence. This competition is open to entrepreneurs at any stage, from any industry. All teams must have at least one member currently enrolled as a student at the University of Saskatchewan. The University of Saskatchewan Industry Liaison Office's (ILO) annual business plan competition is an opportunity for entrepreneurs to launch their technology-based business ideas. Tech Venture Challenge is open to anyone with a University of Saskatchewan affiliation - employees, researchers, students and alumni. This contest runs from October to April every year, where participants develop their business plans by receiving mentorship, guidance, and training. The Grand Prize winner receives $50,000 from the U of S Industry Liaison Office and office space from Innovation Place to help get their new venture off the ground. Second and third places also receive funding towards their business venture. SCI-FI Science Camps inspire Saskatchewan's youth through fun, hands-on science and technology programs at the University of Saskatchewan. Each year, they reach more than 10,000 youth from all across Saskatchewan through school workshops, summer camps, and Saturday science clubs. The Computer Science community does not simply end at the edge of the campus. Saskatoon has an exciting and eventful technology community. Conferences, hackathons, workshops, clubs, and dinners are just the tip of the iceberg. By getting involved with off campus groups, students will have the opportunity to network and learn from the industry experts. We invite students who express an interest in computer science from across Saskatoon and surrounding areas to participate in Digitized. Throughout the day, students participate in various activities such as hands-on workshops. These workshops include iPhone and Android mobile programming, robotics, animation, digital media, and creating video games. Students also attend speaker presentations from experts in the industry, with topics such as gaming, mobile, entrepreneurship, software development, cyber-securit, bioinformatics and more. Over 350 high school students attend every year, ranging from grade 10, 11, and 12. The event wouldn't be a success without the help from over 40 volunteers, a number of high school teachers and sponsors. BarCamp is an international network of user-generated conferences. BarCamps are open, participatory events whose content is provided by participants. At BarCamp, there are no spectators, only participants. Attendees should prepare a demo, a session, or help with one, or otherwise volunteer / contribute in some way to support the event. All presentations are scheduled the day they happen. BarCamp participants help to select the topics they want to see and talk about. Anyone is welcome at BarCamp. Attendance is usually diverse and includes software engineers, web developers and designers, application and game developers, marketers, entrepreneurs, students and artists. Canada Learning Code is a Canada wide not-for-profit organization providing women, men, and kids the opportunity to learn beginner-friendly computer programming and other technical skills though hands-on workshops. They design the workshops where everyone feels comfortable learning computer programming in a social and collaborative way. You can sign up to attend future workshops as a learner, or you can volunteer as a mentor to assist with learners. Girl Geek Dinners are made up of women in Saskatoon and surrounding area who are involved in Science, Technology, Engineering, and Math (STEM) fields. These dinners are an up and coming version of the orginial Girl geek Dinners that originated in London, England. Girl Geek Dinner communities can now be found all over the world and bring together females from around the globe with a common goal of meet, inspire and encourage. Saskatoon TechWorks Inc. is a makerspace (or hackerspace) that is focused on science, technology, culture, mechanics and the digital arts. They offer a space where people with diverse backgrounds can socialize, collaborate and learn. Through shared resources, knowledge and ideas they strive to create an atmosphere that promotes community and learning. They also fulfill our role as a community resource by hosting workshops on electronics, programming, crafts, and any other skills that members (or guests) are willing to share. Experience the valley tech scene in Saskatoon at Vendasta's Ideas on Tap. Every month, Vendasta hosts a series of industry speakers to talk about the latest trends, topics, and technologies. Everyone is welcome to attend or to give a presentation. Google Summer of Code is a global program that offers students stipends to write code for open source projects. They work with many open source, free software, and technology-related groups to identify and fund projects over a three month period. We need volunteers to help with a number of outreach events designed to generate interest in Computer Science with elementary, high school, and university students. For more information on how to volunteer, please email our Outreach Coordinator.